By now, I’m sure you’re all sick if hearing me Facebook and Tweet about Jenny Lopez has a Bad Week, my I Heart short story. But just in case you aren’t and you’re in the UK, please download it before the 23rd May from Amazon, iBooks or other e-tailers while it’s freeeeee! The story stars Angela’s best friend, Jenny Lopez and follows her return back to New York City. Obviously, a girl can’t get by without her best friend so Angela and Alex both make an appearance – rude for them not to, right? If you’re outside the UK, we’re still working out exactly how we’re going to get it to you – honestly, there’s no personal grudge against you, it’s just that the book is published by my UK publisher and they can only put it out in certain territories. Hopefully we’ll be able to put it out somehow! Pre-order What a Girl Wants and win Champagne with Lindsey! I was able to download the Kindle version from Amazon US. Loved it! Angie, you can download Kindle onto your mobile device or computer for free. Then download Jenny. Just want to thank you again! I’m so lucky and I loved Jenny Lopez Has A Bad Week! Totally entertaining! I loved reading as much as you loved writing it! I hope there’s more to come! Jenny is so feisty and carefree! I would want to read more on Jenny’s relationship with Sigge! Again, fab story and thanks! Oh, yeah. Here’s my other review! I wasnt sure how i would like reading about Jenny when I was such a big Angela fan but I really enjoyed this short story. My only critism would be that it was too short but I guess thats the point in a ‘short story’. I honestly think I would just like anything that Lindsey Kelk writes as its her style of writing that I really enjoy. Its very light and funny and has this powerful ability to pull you into the story and make you feel as though you are part of it. I can’t wait for the next book and I am so happy that I only have to wait a month! The short story was amazing! please please please with a cherry on top write more of them, or do a full book of jenny instead of a short story!! and also, when will I heart vegas be coming out and please give us some hints about what will happen with I heart vegas! There is an I Heart Vegas??? Really??? Woo hoo, thank you! Can’t wait!! Meantime loved Jenny’s short story, as suggested above any we’d love more!! 🙂 yay also relieved its only a month until the next book ..
Amazing, amazing, amazing book. At first it felt a bit funny when Angela was mentioned but it was great to see her and Alex from another prespective. P.S.Thank you so much for giving this away for free! Try Max Factor Lashfinity too. I’m SO happy I’m not alone! Thanks for writing so wonderfully – you are truly great an I can´t await the next books. It’s not scheduled to come out in Germany just yet – sadly it’s all down to the individual publishers – but if that changes, I’ll let you know! Thank you for this great FREE download.. I was half way through ‘ I Heart Paris’ & wondering when I was going to hear from Angela & Co again when I came across your blog and downloaded ‘Jenny Lopez has a bad week’ just before the free deadline (phew!). I was planning to wait some time before reading it, you know savour it and all that ( is that weird?) but then I unexpectedly ended up having a stay in hospital with no books to read!! 🙁 and lo and behold Jenny Lopez bad week has helped me have a good one!! ( ok maybe not good, hospital is never good) but she was there when I needed her. Thanks Lindsay! love your I heart books. The Jenny story needs to be a novel(several). And please continue more about Angela. Thanx for a good read. i download them on Kobo in Canada. I do not have a kindle and i am really the sort of person who likes a proper book with pages to turn. is there going to be a paper back of this – i feel i am missing out!!!! I am currently waiting for I Hear Las Vegas to be delivered. I really enjoyed reading the other I Heart books. I got the I Heart New York book free in a magazine and loved it. 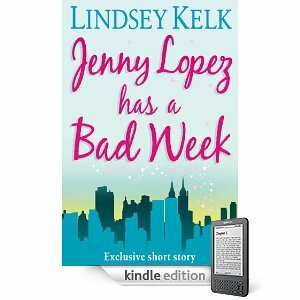 Ive read Jenny Lopez has a bad week, I enjoyed reading from Jennys perspective was nice change. I hope this turns into a novel or a few more short stores as the ending was a bit of a cliffhanger which definately left me wanting to read more about Jenny.